1. The Gemini birthstones: The grounding Agate and the stabilizing Tourmaline. The Gemini sign of the zodiac is known to be a sign of duality -- two natures within one soul. It is a sign that is quite active both physically and mentally with an ability to do multiple things at once. While the ability to multitask is a desired skill, the nervous tension that it creates sometimes is not. This is where the Gemini birthstone, the Agate, can prove to be useful. The Agate has a grounding affect on the native and can help him focus his energy so it doesn't get spread too thin. In addition, it can also assist with the integration of the duality that's present in the Gemini native creating a more holistic, integrated nature. The Tourmaline has a similar affect on the Gemini soul except for the fact that it works a bit faster than the Agate. It is useful, in addition to the Agate, for becoming more grounded and better able to pay attention to practical matters. 2. 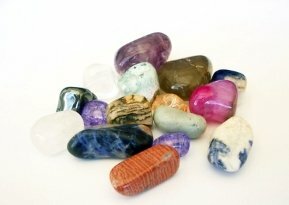 The Chrysocolla and Agate Potential: The Gemini soul is an expert communicator, able to gather enormous amounts of information while intuitively connecting the dots between the missing pieces. Sometimes a bit too excited and eager to share what he's learned with masses, the Gemini individual might speak before thinking of the consequences. The Chrysocolla is the ideal stone to help him understand when it is the right time to speak and when it is a better idea to stay quit. Add to that the depth of the Agate -- and you have an individual who will not only know when and how to speak, but who also will provide insight that is truly enlightening and meaningful. 3. The Gemini Soul Pathway Stone  The Apophyllite. The Gemini soul is on the path of clear and unambiguous communication. The soul needs to be able to express itself fully and accurately in order to be content. However, the Gemini sign individual needs to learn that that communication cannot only take place on a physical and mental plane but must also incorporate the emotional and spiritual dimensions as well. It is the Apophyllite that can facilitate this process. It can show the Gemini sign soul how to integrate the multiple levels of the universe and how to truly connect the all the dimensions within himself.